Upgrade from Schaller M6 tuners to Schaller M6 Locking tuners. Upgrade the stock strap buttons to Schaller Strap Lock Buttons. Replace the White 3-ply & Brass pickguard with a White 3-ply pickguard (White/Black/White). Choose between Gold, Chrome, or a Mix of Gold and Chrome hardware as displayed in the photos. The body features a triple single coil setup mounted in a custom plastic/brass pickguard made by AxetremeCreations. A standard 5-way pickup toggle made by CRL allows for smooth pickup switching. There is one master volume, one tone knobs, and one blaster knob. The blaster knob at the lowest setting provides subtle gain, and at the highest setting can push your amp to light distortion. There is one 1/4" output jack recessed on the top of the body. On the back of the guitar, there is a 9V battery box that powers the built-in blaster circuit. The harmonica style bridge and curved tailpiece are by Kluson. 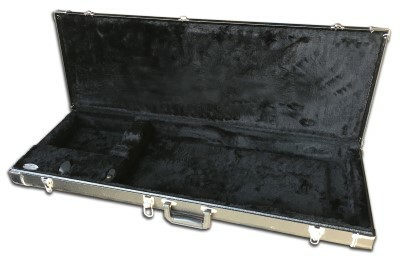 We offer an optional custom hard shell case to go with the Project Gator guitar. The smooth satin finish maple bolt-on neck is attached to the body using 4 wood screws. The back of the neck contour is a C-shape that feels somewhere in between a strat and an LP neck, not too thin, and not too chunky either. The 22 fret maple fretboard features medium jumbo frets which are leveled and milled here at our shop in California for a nice smooth feel along the edge of the fretboard. The fretboard features a 12 inch radius which is perfect for soloing and playing chords up and down the fretboard. Topping off the fretboard are standard dot inlays. At the top of the neck, you'll find a bone nut for good sustain. The flat 6-inline signature headstock shape includes our widely recognizable 'ph' logo. Under the fretboard is the adjustable double-expanding truss rod, keeping the neck stable in any climate. The electronics feature a CRL 5-way pickup toggle, CTS 250k Audio Taper pots for volume and tone knobs, a Blaster circuit by FuzzDog's Pedal Parts, and a 1/4" Switchcraft output jack. All wired together in our guitar workshop with vintage push back cloth wiring. The 3 pickups installed are DiMarzio Area 58 single coil pickups, designed to recreate the vintage tone of a 1958 single coil pickup, but with less magnetic pull and virtually no hum. As DiMarzio states, "A great pickup is clear and bright, but not thin-sounding. A great one makes the sound jump out of the amp when you pick hard and drop way down when you play softly, and the tone varies when the string is picked at different spots. The best pickup we’ve ever heard like this was from 1958, and that’s what inspired the Area 58™." The guitar body, neck and bone nut are manufactured in China. The other parts are sourced locally and the guitar is assembled and setup in our Southern California workshop. The white and brass pickguard includes the Alligator sticker, Harley Davidson sticker, and Policeman Helper sticker. Stickers are by AxetremeCreations. The white 3-ply pickguard does not include the stickers mentioned above.